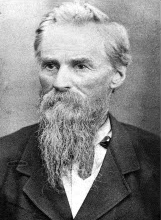 John Ritchie was a leader in the free-state movement, working closely with city founders to ensure Kansas came into the Union with a constitution that prohibited slavery. His home on Madison Street also was a stop on the Underground Railroad. Ritchie arrived in Topeka in the spring of 1855. He was one of three men who put up the cash to buy the tract upon which Topeka was being built. The land was owned by a Wyandot. Ritchie, Dr. Franklin Crane and Cyrus Holliday pooled their resources to make the purchase. Each received large tracts of land in exchange. During the Civil War, he enlisted as a private in Company A, Fifth Kansas Cavalry (Lane’s Guards) and was made captain after its organization. He was commissioned to raise a regiment of Natives, and was colonel of the Second Indian. He was breveted brigadier general two weeks before the close of the war. Ritchie was a member of the Leavenworth and Wyandotte constitutional conventions, the latter of which resulted in the document that got Congress to admit Kansas to the Union. He was an active participant in the troubles of 1856, and was for a time a free-state prisoner in Lecompton Prison. He escaped and fled back to Indiana, where he stayed until receiving a pardon from the governor the following year. He was indicted for treason in 1856 by the pro-slavery territorial legislature. A marshal who tried to serve the warrant in 1860 was shot by Ritchie after following him inside his home. Ritchie was acquitted of the subsequent murder charge. He donated the land upon which Washburn College is located; it opened as Lincoln College in 1865. His original homestead, which includes his home and the home built for his son, Hale, is headquarters for the Shawnee County Historical Society. He was born in Uniontown, Muskingum County, Ohio, July 17, 1817. His parents moved the family to Columbus, Ind., when he was 13, and later lived at Greensburg and Franklin in Indiana until the fall of 1854, when he visited Leavenworth, Lawrence and Kansas City. On March 12, 1855, he started again for Kansas, and April 3 arrived at Topeka. He constructed a business building, the Ritchie Block, at 6th and Kansas Avenue. It was home to most of the city’s public activities and several merchants until it burned in 1869. Ritchie was a friend and admirer of John Brown, assisting him to escape from an attacking party when he was leaving in Kansas after his last visit,. Ritchie’s first wife was Mary Jane Shelleday, who died Oct. 18, 1880. She was buried first in the Ritchie Cemetery near what is now SW 27th and Boswell. She and their daughters Mary Jane and Lizzie were moved to Topeka Cemetery in 1888. Their surviving children were Hale and John Jr., who are buried with their wives in the family plot in Section 18. Also there are Paul Ritchie, infant son of Hale and Anna Ritchie; John S. Ritchie and Fred Ritchie, adult sons of John Jr. and Josephine Ritchie; Hale Jr. and Helen Ritchie; and Robert and Mary Ritchie Jarboe. After Mary Jane’s death, Ritchie was married on Oct. 27, 1881, to Hannah Beall, of Cincinnati.